Herping for reptiles and amphibians including lizards, frogs, toads, newts and other interesting creatures in their natural Irish habitat, with locations, pictures and commentary. Herping in Ireland requires patience and perseverance—and a lot of both. First of all, Ireland has no snakes, and no turtles, so strike one and two. The only reptiles existing on Ireland are the live-bearing Viviparous lizard (Zootoca vivipara), and the legless lizard Slow worm (Anguis fragilis). There are just three amphibians—the Common brown frog (Rana temporaria), the Natterjack toad (Epidalea calamita), and the much heraded Smooth newt (Lissotriton vulgaris vulgaris). As you can see, it's slim pickins. Below I'll detail my experiences herping in Ireland, both the exhilarating and disappointing. All photographs are in situ, with the exception of the final picture. The company I work for sent me to Ireland for two months to learn the European side of our business, so when I had some free time after work or during the weekends, I'd do a little herping. 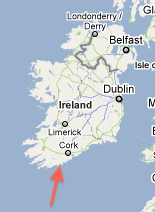 The red arrow on the map to the left shows where I lived—a beautiful little fishing town called Kinsale on the southern coast of the island, about 20 minutes southwest of Cork. Below I'll spend some time describing my Irish herping experiences, ranging from Kinsale to Galway and beyond. In anticipation of having the rare opportunity to do some herping for reptiles and amphibians in Ireland, I did some research online, and ended up finding a great Irish herp forum with members who gladly helped give me valuable advice and direction in my quest to find a lizard, newt, frog, or toad on the Emerald Isle. 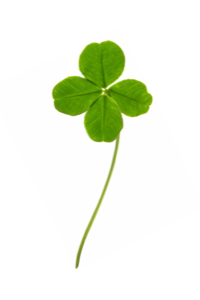 Despite all my preparation, they also mentioned that I was going to need something else: luck. Fair enough. 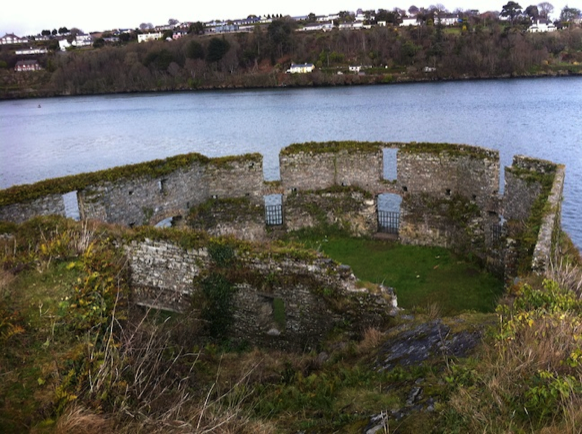 Early on I started herping by frequently roaming the peninsula in Kinsale where I was staying, which was comprised of wide open fields, rocky shorelines, dilapidated military forts from the 1600's, and lots of tall grass and brush. My initial hopes were elevated when I heard a woman walking about 15 feet behind me yelp to her family, "Ahhh! Did you see that? Ireland doesn't have snakes does it?!" I spun around and saw that they were all scanning the tall grass next to the path we were walking on. She was right, Ireland doesn't have snakes, and I doubted she saw a Slow worm, but I wondered to myself—was it perhaps the rarely seen Viviparous lizard? I circled back to the area but didn't find anything. This is the tip of the peninsula on Castlepark where I stayed—the remnants of a defensive fort built to defend against a Spanish invasion. Herping at night was fruitless, as I never really saw anything of interest, other than snails galore. If the climate were warmer, a snail-eating snake would absolutely thrive here. That also goes for any reptile or amphibian that eats slugs. There are lots and lots of slugs. Big ones. After hearing that lizards had been spotted at a historic military fort (Charles Fort) across the bay from me, I naturally made several trips there to do some herping. While certainly a very picturesque site, I didn't find any reptiles or amphibians. Ever. It was frustrating because I knew the lizards were there, coupled with the fact that the weather during the trip had been unseasonably warm and sunny. The rain had been rare, and that in itself, is rare. I walked for miles on surrounding paths and cliffsides where the lizards bask, and never saw one. I even tried getting there early—5:30am to be exact—so that I was around for the sunrise and any early-morning reptile or amphibian activity. This resulted in zero lizard sightings. 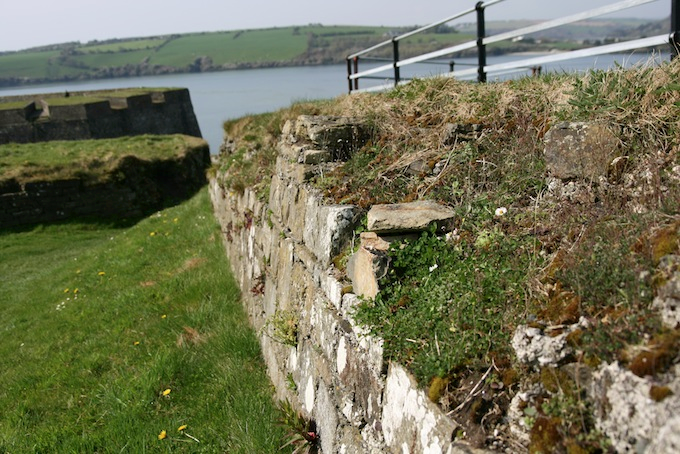 This is Charles Fort in Kinsale, built in 1680. 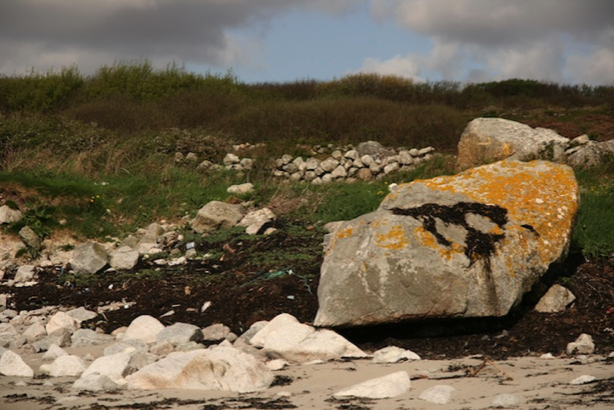 The walls and surrounding seaside cliffs are where the Viviparous lizard is known to bask. 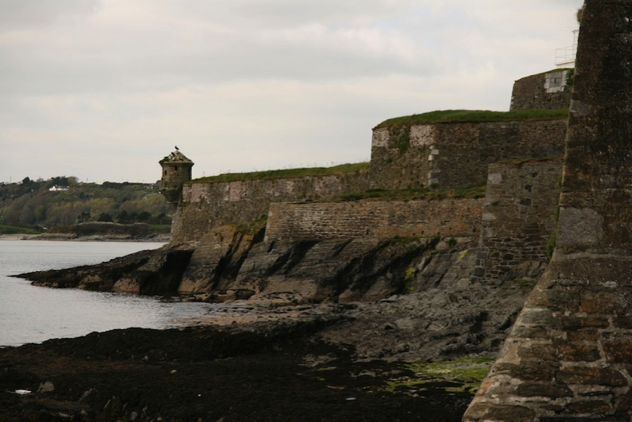 Here is a picture of the surrounding cliffs of Charles Fort. After many trips on sunny days, I never did see a lizard here. Everything was great, though, because I was outside under sunny Irish skies, in a beautifully landscaped country, with panoramic views of the Ocean blue, right? Well, yes, but I still really wanted to find a herp. So, I expanded my search range. Seemed logical. I ventured to nearby Oysterhaven, a small village with several bay-fed saltwater bogs and, more importantly, a reputation of being home to lizards. After arriving, I walked along the bog shores, scanning over the rock walls and flipping the occasional rock. No luck. I drove up the road a half-mile to a bird sanctuary that had a multi-fingered pond, but couldn't figure out a way to get to it without crossing through private property. A missed opportunity indeed. 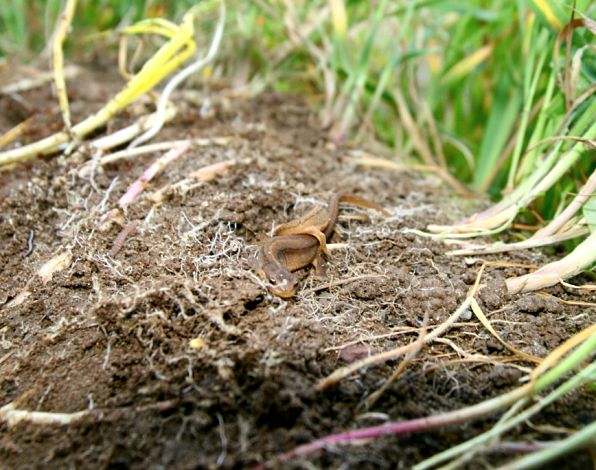 These bogs in Oysterhaven are known to have Viviparous lizard populations. One day while driving into Scilly, a fun town just across the bay, I noticed a small sign for something called the Scilly bog. Naturally I pulled over and took a jaunt through the woods, along the marshy shallow stream and steep vegetation-covered hills. There were some promising-looking rotting logs, but no lizards, frogs, toads, or newts to be found. 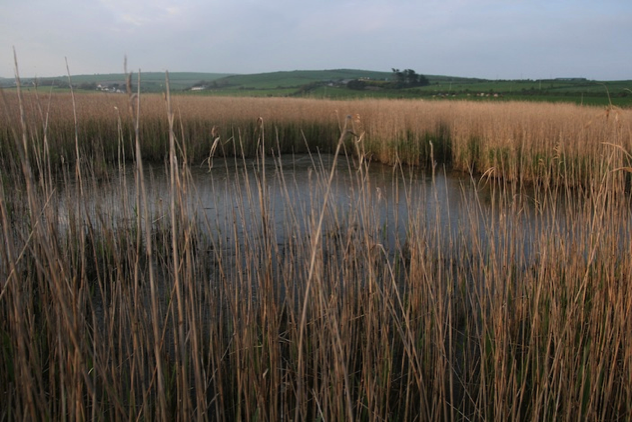 I revisited the Scilly bog three times in total, but never did come across any reptiles or amphibians. 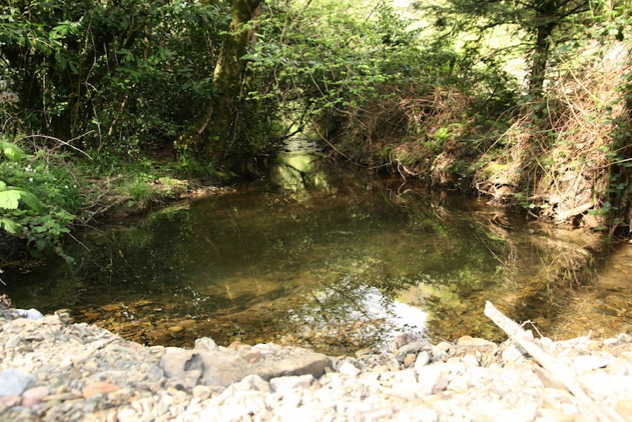 The stream was just too shallow and fast-moving to be an egg-laying site for frogs, toads, or newts. 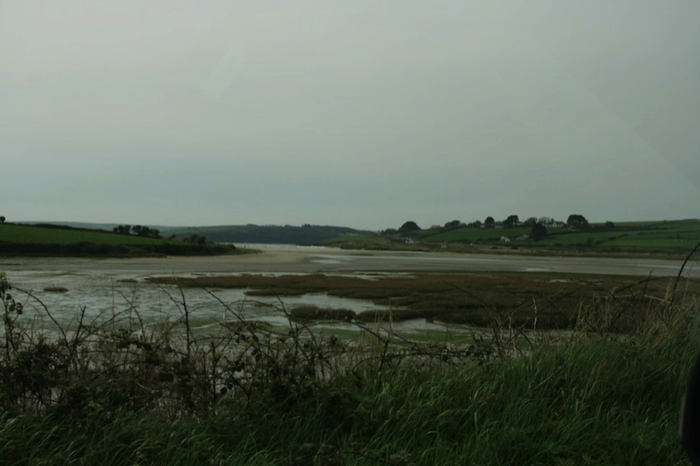 Scilly bog in Kinsale had promise, but after a few trips, seemed to yield very little as far as reptiles and amphibians. One weekend I was driving down a winding road in a forest and happened to notice a good-sized stream running alongside me. I pulled over to investigate. The water was slow-moving, but still no reptiles or amphibians to be found. Then, in front of me, as if a present from above, I saw a large pool that the stream fed into. I was sure, or as close to sure as possible, that I would find something here. At least a frog. The water was still, clear, and about two feet deep. What did I find? Zilch. Other than a sudden swirl of muddy water as something small moved under the dirt overhang where the water met land. Probably a fish. I revisited this pond again a few days later with the same result. I didn't find any lizards, frogs, toads, or newts in or around this stream-fed pool. 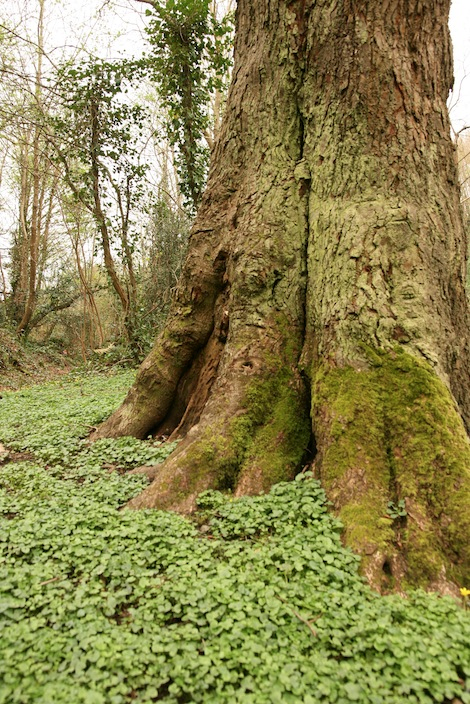 The pool itself was surrounded by lush Irish forests. Old Head is a famous peninsula whose rocky cliffs not only house a world-class golf course, but viviparous lizards as well. The golf club's restaurant serves a filet mignon with béarnaise sauce that ranks amongst the best I've ever had, but the herping was much less gratifying. The seaside land masses are steep, and lizards have been sighted here before, but not today, or any of the other days I visited. 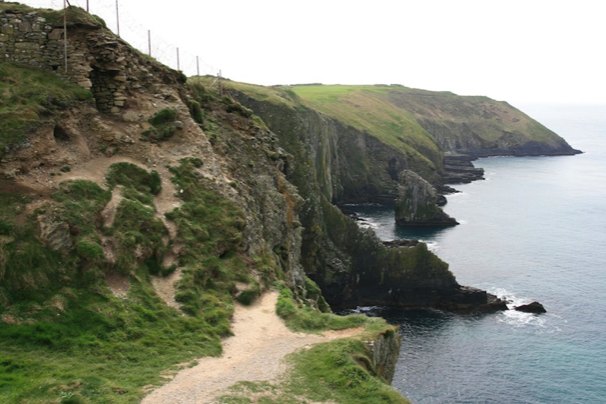 The venerable Old Head peninsula. The Lusitania was sunk by a German U-boat during WWI, just nine miles off it's rocky coast, which resulted in the United States joining the war. By this time I'm willing to settle for seeing a dead frog on the side of the road. I mean, that would at least prove herps exist here. I've been in Ireland for six weeks and no reptile or amphibian discoveries to show for it. Not to mention, we're in the midst of the warmest April on record. About this time I travelled to Galway for the weekend, on the northwest coast of Ireland. I found some time to do a little beach-side herping near Inverin while waiting for a plane flight to the Aran Islands. I didn't come across anything despite some promising landscape. This shoreline in Galway looked to have potential, but I didn't see much more than spiders, slugs, and snails, potato bugs. 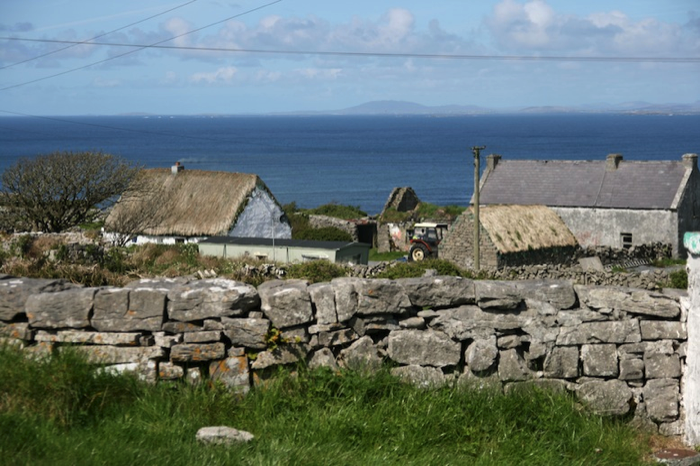 About a half-hour later, I was wheels-up headed for the Aran Island of Inis Mor, the largest of the three islands. Total flight time from takeoff to landing: 8 minutes. On Inis Mor, the temperatures were just plain warm—very uncharacteristic for an island off the coast of Ireland. After renting a bike, I went on a trek along the island's visually impressive high ridges. Rock walls abounded, not to mention ruins from an age gone by, but no lizards to be found. Plenty of little black spiders though. The islands that time left behind. Reptiles and amphibians were not cooperating on this day. 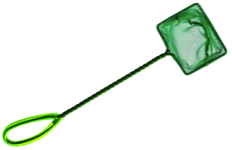 So, by this point, I'd literally have been thrilled just to see a tadpole. Anything. Do reptiles and amphibians really live in Ireland?! I know people say they do, but has anyone actually seen one? Having spent over ten hours herping thus far, I was starting to think I may never find a lizard, newt, frog, or toad during my entire two months in Ireland. But, with that said, I wasn't about to give up. In fact, I became even more determined—almost to a beligerant degree. I decided that I was going to focus on finding freshwater ponds and swamps. There are plenty of saltwater fed bays and estuaries, but what amphibian would hang around saltwater? I had found several freshwater streams, but almost all had currents that weren't conducive to herping or egg-laying. So, I pulled up Google maps, switched to satellite view, zoomed-in, and started manually searching the landscape for inland bodies of water. I had yet to come across a pond or swamp in Ireland, so I wasn't sure what to expect. After about ten minutes of scrolling through screen after screen of green, something caught my eye. It was a nondescript field, but what made it special was that it had a dark blue circle within its borders—a pond. Finally, a pond. They aren't especially common here. I then scrolled a bit further and found another, smaller pond. I was generally familiar with the area, but nonetheless mentally marked both spots, and e-mailed myself a satellite photo of the topographies of each so that I would have it with me on my iPhone while I was navigating. Once I finished up at work, I drove to the house where I was staying, had dinner, and at about 7pm, drove to my target herping destination. The sun was low in the sky and there was no hint of wind—a truly perfect evening. I parked the car, and began working my way through the field towards the first pond. There wasn't much ground cover around the perimeter of the pond, and the shoreline gradient was extremely gradual, meaning the surrounding earth was very, very saturated and muddy. This meant I couldn't get as close as I'd have liked to the actual water. Instead, I was relegated to scanning the depths from wherever I could get a temporarily solid footing. After about ten minutes, I decided I wasn't getting anywhere, so started making my way back to the road. I just couldn't get close enough to this pond to look for amphibians. I remember wishing I had brought waders with me. I hopped in the car and headed to the next, and final, herping site of the evening. It was now about 7:50pm, and the sun was dropping fast, so I didn't have much time. I took a quick look at the google maps screenshot I had e-mailed myself for reference, and began walking through the long grass field towards the location of the pond. Pheasants could be heard calling in the background. I turned over a few rocks on the way, but didn't find anything. After a few minutes of walking through pasture peppered with cow hoof holes, I realized an unfortunate truth: I again wasn't going to be able to get near the pond—the ground was far too muddy and saturated. It was a bit discouraging, but I was encouraged by my new pond and swamp finding method using google maps. 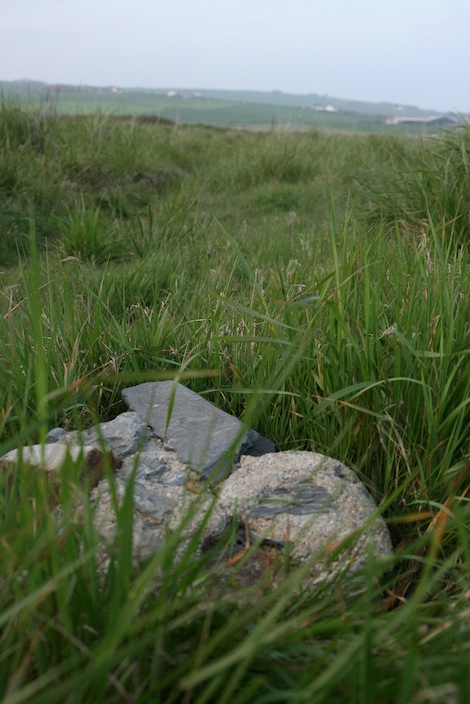 On the way back, about 50 yards from my vehicle, I saw a large piece of cement fragment laying in the long green grass. It looked out of place. I considered just walking past it, but told myself, "Just flip it over, you never know." The same thing I always tell myself. I bent down and turned it over. What happened next is literally something I will never forget. Turning over this piece of rock and cement created a herping memory that I will never forget. I could not believe my eyes. Nestled underneath the large cement piece, I saw something. I knelt down to get a closer look, and realized it was an adult smooth newt! Lissotriton vulgaris, a true rarity in Ireland. A wave of excitement pulsed through my body. This amphibian discovery alone would have made me ecstatic. But, it gets better. Curled up next to the adult newt, was a juvenile smooth newt! Two newts—the luck of the Irish to be sure. Two beautiful Smooth newts in Ireland. 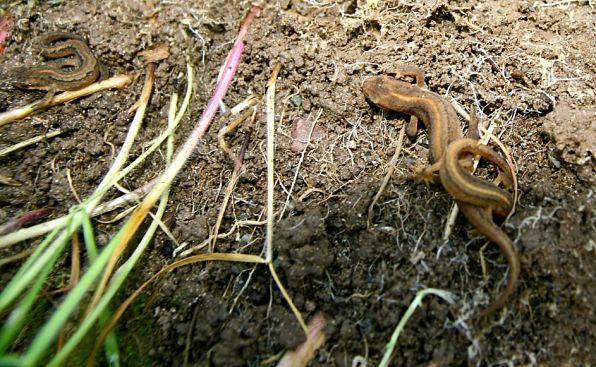 The adult newt is facing the camera, while the juvenile newt is curled-up on top of the adult (in situ). But, it gets better. I noticed something else moving—it was a third newt! Another juvenile. This was, in my mind, unbelievable. My adrenaline was flowing—I could feel it. It actually made me smile, how something so simple could entertain someone to such a strong degree. Three Smooth newts—the third one is on the left (in situ). But, it gets better. Yes, I said it. After taking pictures and a couple movies for about two minutes, my eyes caught movement. There was a fourth newt almost vertical on the back-side of where the cement rock had been laying. I don't have words to describe how amazed I was at that moment. How often do Irish herpers find four smooth newts under one single rock? It's laughable, and extraordinarily memorable! 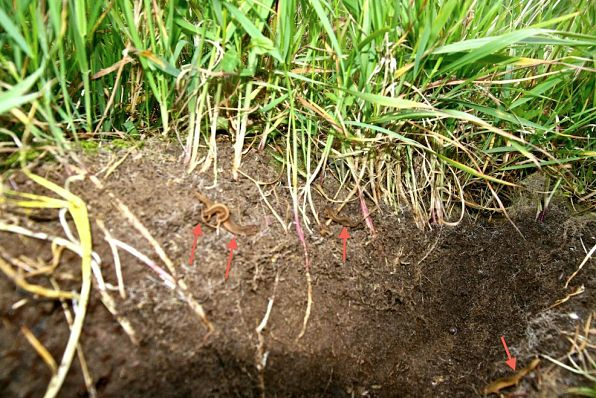 Here are all four Smooth newts—I've added red arrows to point out each one (in situ). The newt on the bottom-right of the picture is the one I didn't initially notice. What made this Irish herping experience so much sweeter for me was that I had set out to accomplish a specific goal, researched and prepared a plan, and saw it through to fruition. As Hannibal used to say on the A-team, "I love it when a plan comes together." Couldn't have said it better myself. 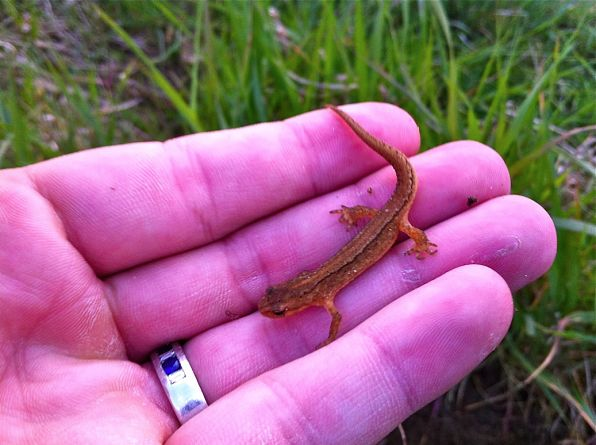 How rare are smooth newts in Ireland? I'm glad you asked. The chairman of the Herpetological Society of Ireland contacted me and said that in the ten years he has spent in Ireland, he has not seen even one smooth newt. Not one. In this video I took, you can see all four Smooth newts as I found them (in situ). It was a herping "lifer" as they say. Here's one of the juvenile Smooth newts. They were quite active and fairly quick on their feet.